The covering shield provided protection against the enemy ships and allowed the vessel to get close to the enemy without the cannon being noticed. Once the vessel rammed the enemy, or got close to it, the shield would open to reveal a huge cannon. The shields are attached to a system of winches which open very quickly when the brake on the mechanism is released. 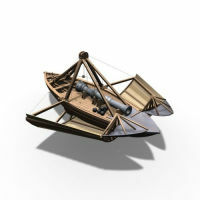 Once lowered into the water, the shields could also function as a brake for the recoil of the cannon. In order to close the shields the system of winches would be operated manually. This machine, therefore, is provided with a number of functions: the ram, the cannon, the shields and an ingenious system for operating them. In his drawing Leonardo presents a number of solutions for the shape of the shield and perhaps he was not sure about its geometry, which in fact is incorrect – the right geometrical form of the shields lies somewhere between all the ones he drew. Leonardo’s idea for this machine can be considered revolutionary but, like others, difficult to implement.